OnTheClock is a time-saving application that brings innovative solutions for HR managers in big and small companies. This product has been helping businesses from every niche because of its general nature and it has become a popular product therefore. OnTheClock helps you to mange time cards and punches to keep a track of your employees’ activities. With some useful solutions and scalable features available, OnTheClock can help you boost your productivity as a business. The software was introduced in 2003. Considering the time it has spent in the market, it can be easily predicted how popular this product has been in the market. Managers love it because they can generate time cards effortlessly. Hence On The Clock can be a valuable addition to your company. Managing punches is not only easy but enjoyable too with On The Clock. You get to choose the type of punch recognition you like. Whether it’s biometric punching, device based punching or GPS, On The Clock gives you all the options. What’s more is that your workers can punch from their desktop, tablets and even their personal smart phones. If you wish to edit your time cards, all the changes are made instantly as On The Clock updates your information in real time. You can therefore import information from your current payroll service providers. Hence you can synchronize all the information to make sure that there are no discrepancies. On The Clock is more than time keeping. You can also set your employee schedules and changes shifts effortlessly. It’s a lot more fun when you can simply drag and drop employees in their designated time slots instead of typing down all the information. Publish schedules and share them with your staff in a matter of minutes. The dashboard for On The Clock is a great place to view all your employee punches and activity status. At one place, you can view all the parameters related to timings and you know exactly which employee is in or out of their seats. The display is quite intuitive and engaging which makes your dashboard experience even more enjoyable. If you are considering OnTheClock it might also be sensible to check out other subcategories of Best Employee Scheduling Software listed in our base of B2B software reviews. Enterprises have different needs and requirements and no software solution can be just right in such a scenario. It is useless to try to find an ideal out-of-the-box software app that meets all your business requirements. The intelligent thing to do would be to modify the solution for your unique needs, worker skill levels, budget, and other elements. For these reasons, do not hurry and invest in well-publicized trendy applications. Though these may be widely used, they may not be the best fit for your specific requirements. Do your research, investigate each short-listed system in detail, read a few OnTheClock reviews, speak to the seller for explanations, and finally select the application that offers what you need. How Much Does OnTheClock Cost? We realize that when you make a decision to buy Employee Scheduling Software it’s important not only to see how experts evaluate it in their reviews, but also to find out if the real people and companies that buy it are actually satisfied with the product. That’s why we’ve created our behavior-based Customer Satisfaction Algorithm™ that gathers customer reviews, comments and OnTheClock reviews across a wide range of social media sites. The data is then presented in an easy to digest form showing how many people had positive and negative experience with OnTheClock. With that information at hand you should be equipped to make an informed buying decision that you won’t regret. What are OnTheClock pricing details? 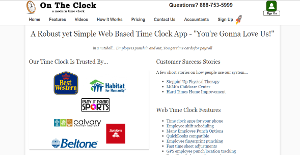 What integrations are available for OnTheClock? If you need more information about OnTheClock or you simply have a question let us know what you need and we’ll forward your request directly to the vendor.